Cooking competitions are always fun, especially if the prizes are good and everyone can participate. This is exactly the case with Home Chef’s exciting Meal Makeover competition that starts at noon CT on September 14, 2018 and ends at noon CT on November 9, 2018. The rules are pretty simple and the winners get some pretty useful and valuable cooking-related prizes. If you are a Home Chef patron or want to become one, keep reading to find out how Meal Makeover works and what you can win if you choose to take part. All Home Chef patrons who place at least 4 weekly orders scheduled for delivery between September 17th and November 16th automatically enter the competition. No further steps are needed. 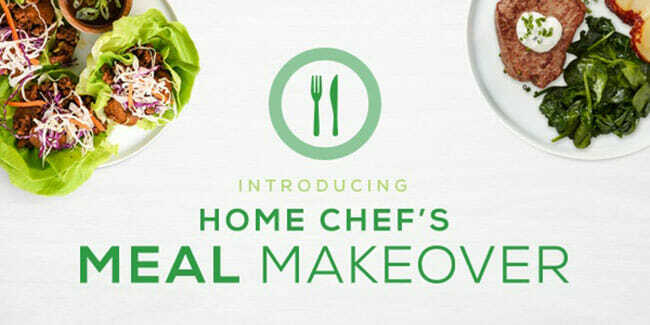 Just cook with Home Chef for 4 weeks and you can become one of the winners. However, it this option does not work for you, there is another entry method you can consider. You can send a 3×5 postcard to Home Chef’s headquarters. The postcard should include your name, address, phone number, and email address. It should be sent to Relish Labs LLC d/b/a Home Chef, 400 North Michigan Avenue, Suite 1400, Chicago, IL 60611, Attn: Legal Dept. The postcard must be postmarked between September 14th, 2018 and November 9th, 2018 and received by November 23rd, 2018. It is important to note that to take part in the competition, you need to be of legal age and a legal resident of the contiguous US. You also need to live within Home Chef’s delivery area. The winners of the Meal Makeover competition will be determined via a random drawing in order to maximize objectivity and give everyone equal chances to win. Home Chef plans to announce potential winners on December 1st, 2018. Finally, the most exciting part: the prizes. Home Chef has decided to award 1 first prize, 1 second prize, and 10 third prizes. $1,000 in Home Chef credit. $500 in Home Chef credit. A copy of Maria Menounos’ cookbook, The EveryGirl’s Guide to Cooking. Now that you know what lovely prizes you can win, all you need to do is pick your preferred entry method – and with a bit of luck, Home Chef may surprise you with an early Christmas gift.